For 20-year-old Matthew, a student at university in Glasgow, getting to grips with cooking for himself on his first time away from home was a real learning curve. Now totally at ease in the kitchen, he looks on the experience as literally life-changing. "To be honest", Matthew says, "before I left home for University, I didn’t give a great deal of thought to how I would feed myself. I had learned some basics so I was able to make a few things, like spag bol, the student staple, and I was more concerned with all the other challenges in front of me, particularly the academic ones! "I think it was when I realised there is only so much spag bol you can eat that I started to think cooking for myself might be important after all. Weeks and weeks of trying to keep up with difficult new work, and socialising into the wee small hours with new friends, eventually takes its toll." Coping - or Not Coping? "At first I couldn’t believe that snacking on nothing but junk food and sometimes skipping meals altogether could have serious effects. But on my first visit home after a few months, the family’s comments on my unhealthy appearance made me take a long hard look at the way I was coping - or rather not coping." Matthew admits that he was losing focus with his studies. He had much less energy than before and, worryingly, he was starting to look flabby. "That did it," he admits. "After a lifetime of healthy home cooking I was suddenly living mainly on junk food. My diet and lifestyle were taking their toll on my system and I desperately needed to turn things round." He returned to university armed with a new pan or two and some cooking lessons from Mum under his belt. "I resolved to fill up on as much fresh food as possible, not difficult since I’ve always enjoyed fruit and vegetables", says Matthew. "I took time to seek out the best and cheapest places to shop. I got to know the best times to find the freshest produce and when to pick up a bargain." Did This Mean an End to the Fun Times? Did this mean that Matthew was suddenly living completely differently, cut off from the diversity of university life? "Good heavens, no", he admits. "I wanted to enjoy everything about my experience of University - the friends, the new interests and the social side as well as the study that would hopefully mark out my career. But it took some reorganising and a commitment to set aside time to eat more healthily. The upside is it all became easier as time went on. ‘Within weeks of changing to a diet of healthy, freshly cooked food, my concentration powers, my energy and my appearance were all improving. Also it was becoming easier and quicker - the shopping, the food preparation, the cooking - and, something I didn’t expect, I was actually enjoying it. "Getting organised pays dividends. I got into the habit of preparing double portions for the fridge or freezer. I would buy fish, or chops or chicken portions, wrap them in a parchment parcel with vegetables, and chuck the whole thing in the oven. It saves on pots and washing up and is a pretty foolproof tasty meal. And I tried most of the time to have breakfast. One tip I would pass on is to do some washing up as you go along and just leave it to drip - I never dry dishes. "It’s good to keep a stock of frozen vegetables to save time, and to eat whole grain foods which fill you up for longer. 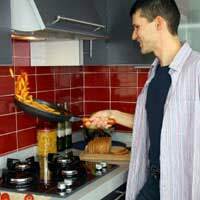 At exam time, when time is really short, and I’m starving, I can whip up a filling omelette in minutes." So how did Matthew’s friends react to his new lifestyle? Mathew explains: ‘Well these days it’s cool for guys to be interested in cooking. True there were jokes about me letting the side down and abandoning student traditions. I hadn’t, of course. But I learned that if you are on an intense course - I’m doing engineering - you need to have the stamina for study and, hopefully, a social life too. It was no different for my friends. I’m not saying they suddenly developed an interest in eating healthily. But we all came to realise that you need to take care of your body if your mind is to be at its best. "And taking an hour or even less to prepare and cook a healthy meal or two still leaves me plenty of time for everything else."